CASHFLOW 202 by Robert Kiyosaki Cashflow 202 enhance your financial knowledge with advance business and investment techniques! This package contains new instruction manual, 12 short sales envelopes, 5 stack of deal cards, 1 stack of cashflow 202 worksheet and 1 stack of accounting sheets. Use this game to learn and practice real world investing. Get out of the rat race and achieve financial freedom even during the current worldwide economy downturn. Learn to plan your strategy. . The CASHFLOW board game from Rich Dad Poor Dad is an advanced investing game that allows players to move past the fundamentals of personal finance. CASHFLOW 202 lets players learn about sophisticated investing strategies like options, straddles, stock selling, and real estate exchanges. The game is an updated version of the original CASHFLOW 101 board game with different professions and cards. This set comes complete with an instruction manual, eight audio CDs, envelopes, cards, and a stack of sheets. item 1 Rich Dad's Cashflow 101 boardgame. "Get out of the Rat Race" Kiyosaki. 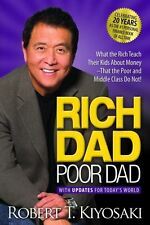 -Rich Dad's Cashflow 101 boardgame. "Get out of the Rat Race" Kiyosaki. item 4 Cashflow 202 Board Game Rich Dad Poor Dad Robert Kiyosaki Money Investing New. -Cashflow 202 Board Game Rich Dad Poor Dad Robert Kiyosaki Money Investing New. I am always looking for worthwhile games for my now teenage grandsons. This is a doozy, introducing financial concepts they will encounter in life. Recently, one set of boys asked to borrow it to play with aunts, uncles, and cousins at a family gathering. We have a very impressive collection of games from which they chose only Cash Flow. The game is fun and good for learning about finance, but there is a new version that makes use of less than half the materials which is much more effective. The use of ledgers (calculation sheets) makes it quicker and gets rid of endless paper money and chips. Everyone I introduced to this game loved it, but I recommend the new one more. In my case, I made new sheets based on the new game design, and never unpacked the money pack or the chips. Great game great concepts... Bad disks? Love the game, one of my children caught on right away and is understanding the concept completely, the other not so much. I wish all 5 disks would work, but waiting to hear back for a replacement disk 2 which is unreadable, while all others worked fine...I bet that is the IMPORTANT disk!!!!! This game can teach you how to get out of the "rat race" in real life, IF you play the game of life the same way that is necessary to win this board game. REALLY!! It IS fun too!! PS giving to charity helps in the board game AND in the game of life.